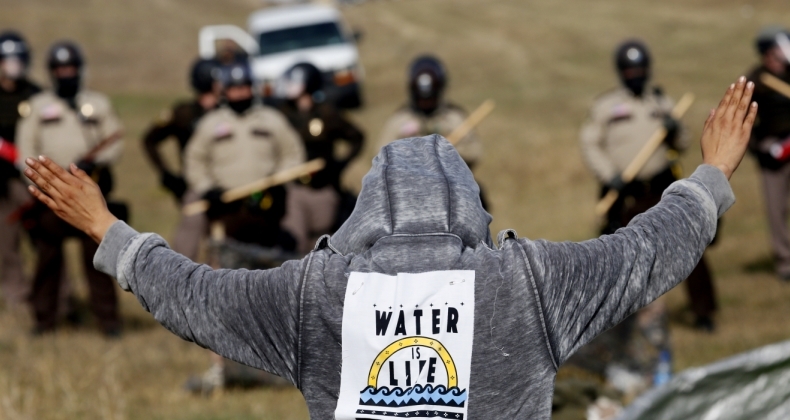 As tensions escalate at the site of a disputed pipeline close to the Standing Rock Sioux Reservation in North Dakota, Amnesty International USA (AIUSA) has sent a delegation of human rights observers to monitor the response of law enforcement to protests by Indigenous communities. AIUSA also has sent a letter to the Morton County Sheriff’s Department expressing concern about the degree of force used against the protests. The organization will also call on the Department of Justice to investigate police practices. Arrests of protesters, who call themselves water protectors, have increased in recent weeks and law enforcement has employed a more militarized response to protests and encampments near the construction site of the Dakota Access Pipeline. The local Indigenous communities say the pipeline endangers their water supply and desecrates sacred land. This week, arrests have occurred at a camp that was recently established on federally-recognized private land near the construction site. 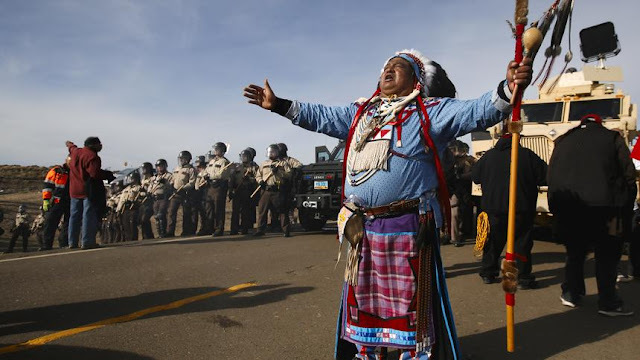 AIUSA sent a delegation of observers to the area in August and has stayed in contact both with the Indigenous community and those policing the protests since then. 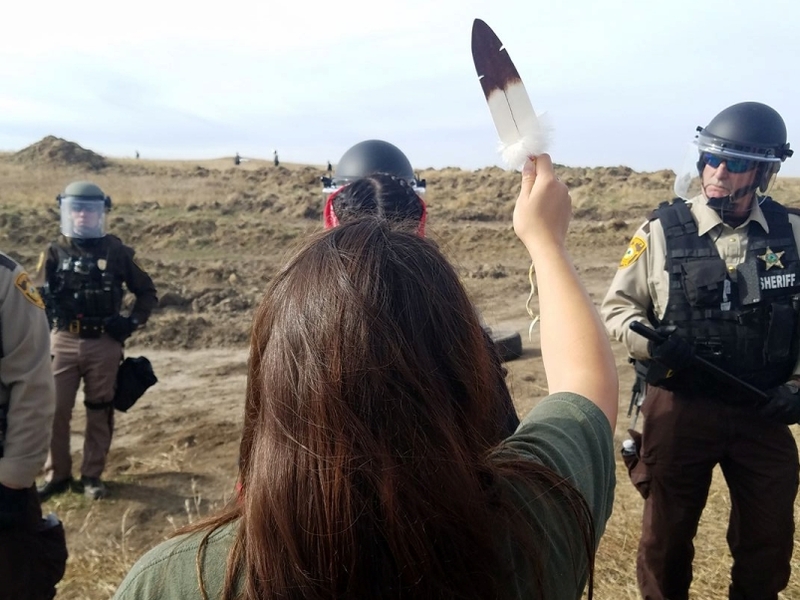 Letters had previously been sent to the North Dakota Highway Patrol and the Morton County Sheriff’s office calling for law enforcement officers to respect international human rights standards on the policing of protests. In some instances, police have responded to protesters with pepper spray and bean bags, and in one instance, private security staff used guard dogs. Those recently arrested have reported being strip searched and forced to pay bail for minor offenses. Members of the media and legal observers have also been arrested or charged with minor offenses. 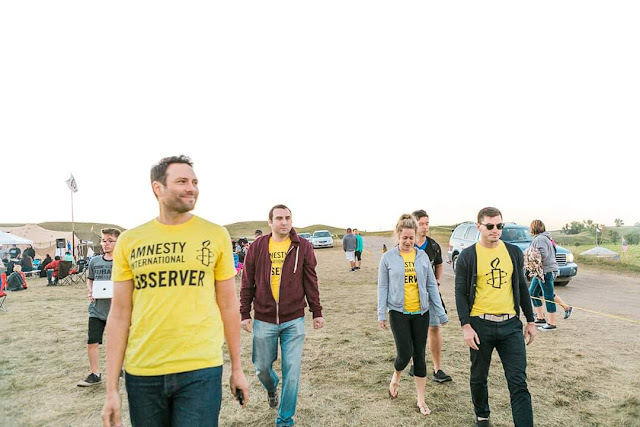 Responses to "Amnesty International USA Sends Human Rights Observers to Standing Rock "
Good. . The message is clear. . There is good reason for their being there. . It's a shame that within this nation that calls itself a democracy, where their is equality, justice, and freedom should require the presence of this group to observe and provide assurance should tell us that something is wrong with our idlogy and it needs to be looked at in depth by our so called leadership who we have selected to lead us into the future. Perhaps we should further explore what we really want for leaders at the same time. Thank you for all that you do! Please protect our waters and ensure safety for all those that are involved. May we find peace and protection forevermore. Water is Life. Prayers from the Order of the Merciful Christ of the Celtic Christian Church. Let us walk the path together! Sr. Patti.